For other uses of the term, see Cold Steel. Cold Steel is a flag based in the Emerald Archipelago of the Cerulean Ocean. This flag was originally created on the retired Midnight Ocean. The flag Cold Steel was created at the end of February of 2004 by most of the surviving members of the flag Phantom Armada, after that flag was destroyed by a coup d'etat which effectively deposed and ejected the monarch with little change in the rest of the population. At that time, it consisted of the crews Sea Ogres, Pillagin' Pirates, Do Nothing Pirates, and Genocide (which was later renamed to Chimaera). The royalty were Amaena (queen, captain Genocide), Rebootkid (Genocide), Saben (Genocide), Jinia (Sea Ogres), Badgundo (captain Sea Ogres), Freeze (Sea Ogres), and Seasick (Sea Ogres). The name 'Cold Steel' was invented by Badgundo. Major causes of the revolution in Phantom Armada were disputes over the operational control of the flag's shops and the unbalance in royalty between the two major crews, Sea Ogres and Bilge Rats. Consequently, Cold Steel started off with the idea of balancing royalty among crews, and distributed the deeds to the four shops they inherited one each to their traditional general managers, who were given relative autonomy. Wrasse Island was blockaded and taken the next April with significant help from allies, especially of doom and Ruby Phoenix. Jinia was made the first governor, and colonization commenced. The flag was later joined by the crew White Widows, though a few months after the Widows' joining, White Widows and Sea Ogres split from the flag and joined with another crew to form the flag Eternal Umbrage. The Sea Ogres' first mate Jinia, the island governor and a flag loyalist, was expelled and with a few other like-minded former ogres started her own crew, Crazed Mob, which remained in the flag. Eventually Eternal Umbrage also fractured, and the Ogre/Widow splinter crew of Polaris came to join Cold Steel. Early in 2005, Heros of Doom joined up, and Saben splintered from Chimaera to form the microcrew Gryphon. In May of 2005, Polaris, Chimaera, Crazed Mob, and Gryphon merged to form Orion's Blade, leaving only token captains in their old crews in case idle crew members returned. At about the same time the crew Seductive Succubi joined for a short period, leaving the next July. Later the same July, the crew The Phoenix joined the flag. In 2006 Cold Steel was home to many of the same crews, with Orion's Blade continuing to be the central crew to the flag. The crew First Class Pirates joined in mid 2006, which eventually merged with the newly formed crew Plank Tarts, which was a split off of Orion's Blade. Due to the declining activity of the flag, in early 2007 Orion's Blade merged into Plank Tarts to try and regrow/revitalize the flag. In the turning a new corner, the rest of 2007 saw the joining of many new mates and three new crews: Eloquent, Beantown Buccaneers, and Vanguard of Villainy. A fourth crew, Pirates of the Winds, was a split off of the crew Plank Tarts. Most recently the Flag saw the return of previous members with the crew Troubled Seas. 2008 saw the split of the crew Plank Tarts into a new crew Chimaera, which predominately made up of previous members of Orion's Blade. 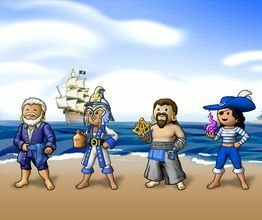 Plank Tarts remains as previously created, which includes the merging of the members of the previously split off crew Pirates of the Winds. 2009 has been a time of excitement for Cold Steel. In January 2009, Cold Steel lost its first blockade in its history and Wrasse Island to Blood and Roses after pulling out in the third round. A month later, Cold Steel regrouped and retook Wrasse from Blood and Roses in a tightly contested blockade that lasted 5 rounds. 2009 also has seen the creation of a new crew Windbreakers, in May 2009, which was a split off of Chimaera. In October of 2009 Cold Steel took a second island, Cnossos, in a blockade against the brigand king Brynhild Skullsplitter. Also see the information under Wrasse Island. Cold Steel is run by a Grand Council, a number of representatives to which are sent by member crews based on their active population. All councillors are either royal or titled, and no non-councilor is royal or titled. Royalty are chosen by the council, and their primary purpose is to implement the will of the council in the game, though they also may act independently in situations which require swift action such as blockades. The governor of Wrasse is also selected by the council. His or her duties are to maintain the flag treasury, to maintain stocks of rum and cannonballs for the defense of the island, and to disburse the island's tax income in amusing ways. Governors nominally serve three months terms, although in practice elections have occurred only when an aspirant appears or the incumbent resigns. Cold Steel as a flag does not and cannot own any shops. As a measure intended to prevent messy breakups of the type that the flag was created from, all shops owned by Cold Steel members are considered their personal property, though the flag may and often does provide a loan of some sort. This page was last modified on 21 February 2017, at 18:37.